They've found evidence of nothing.... while ignored mountains of damning evidence against the Obama/Clinton administration and the DNC. Again, the ignorant and polemics will claim that's whataboutism, but it's actually about consistent application of the law. All the Dem/Medias hand waiving has has little to do with Russian Collusion by Trump, or even obstruction. They found things like Manafort kited money while working for the Obama administration, Papadopoulos made a minor mistake in wording, and after's Flynn civil rights were violated he did something that hasn't ever been enforced since 1806. And somehow that's supposed to reflect poorly on Trump. To the informed, it proves that there's a witch-hunt. Paul Manafort was charged with not reporting foreign income while working with the Democrats (Tony Podesta: Hillary's campaign chair's brother), pre-election. While only briefly on the Trump campaign, he was let go days after Trump's first security briefing. George Papadopoulos Hillary lies about secret emails and is let off. George had the book thrown at him for claiming a meeting happened, "before he was made a foreign policy advisor to the Trump campaign", when it was "before it was officially announced", but after they had already decided on him. That's his high crime. Michael Flynn was illegally unmasked by the Obama administration, and may be the first politician ever to be prosecuted under the 1799 Logan Act, for talking to Russians AFTER Trump had won the election, and trying to prevent Lame-Duck Obama from escalating a conflict. Donald Trump Jr. - after Hillary campaign paid Russian operatives for the Steele Pee-pee Dossier, Don Jr. took a meeting with a couple Russian proxies to talk about some dirt they might have on Hillary, but they talked about their strong dislike of the Magnitsky Act instead. (Nothing to do with the election). Trust the Democrats this time, they'd never lie to the public for political gains, unlike all the other times. whenever the latest clickbait falls apart, the Dems/Media shift what this is about to something else (avoiding Hillary, DNC, poor sportsmanship or the Media's failings). Who knows, maybe there's something there. But we sure haven't seen it. 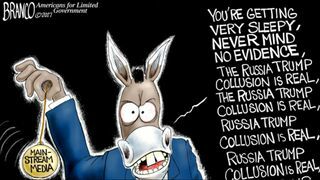 What we've seen is lots of abuses of power and Russian collusion: by the Democrats. the Democrats and the media worked to help Hillary win the primary over Bernie Sanders (giving her debate questions in advance and so on). an incredible double-standard by the media in showing no interest in the dark side of Hillary, the DNC or FBI's actions, and abandoning journalistic standards when it comes to Trump. Most of her Press was positive, most of Trump's was negative and out of context. And the media has had dozens of scoops against Trump that later turned out to be discredited DNC talking points that they had to offer corrections/retractions on. And many of their claims defending accusations against Hillary, turned out to be wrong too. all in the context of Hillary's normal dirty campaign tricks, and the gullibility to believe that within hours of losing on a grueling election day, she and her staff personally discovered the Russian Electoral Meddling that the FBI, CIA and NSA have been unable to find any significant evidence of (then or in the couple years since). 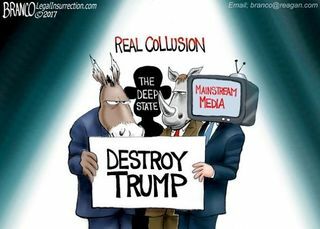 Tthe Dems have gotten caught doing everything they accuse the Trump administration of: election rigging, colluding with Russians, obstructing justice, trying to undermine an election, tearing the nation apart, polarizing the nation, attacking minorities (Coal/Oil workers, Gun owners, Blue collar workers, and other deplorables). You'd think in the face of all that, the public would be getting wise. Well, some are... but others are Democrats. Dems might be smart or nice people in other aspects of their lives, but when you get them on some wild, unproven political conspiracy theory like "the vast right-wing conspiracy", "Trump-Russia collusion", "true Socialism has never been tried", or any excuse for why their side might lose an election other than a uniquely bad candidate (running on unpopular issues), and they're completely unreasonable. This page was last edited on 12 August 2018, at 02:30.